The Faber-Castell 9000 Art Set contains top quality graphite pencils in an attractive tin, perfect as a gift for beginners and professionals. Suitable for drawing, drafting, graphic design, sketching and writing. This Graphite Pencil set includes 12 pencils with varying grades from soft 8B that produces a deep graphite black to a hard 2H with a subtle grey hue. 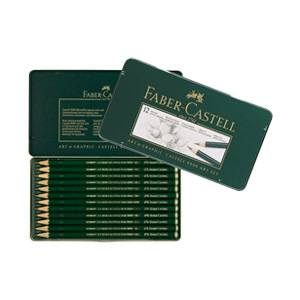 Faber-Castell 9000 Art Set includes: 8B, 7B, 6B, 5B, 4B, 3B, 2B, B, HB, F, H, and 2H.